I use the Dell Support Center regularly to keep my Dell Inspiron Notebook up to date. I have the Enable Scheduled Hardware Scan box ticked and options set to to run the scan on a Quarterly basis on the first day of each month at 23:00 hours. 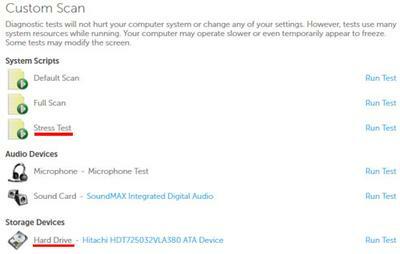 This way the hardware of my Laptop is checked regularly enough for me and it is not too intrusive on my activity. The only hardware scan I do on a more regular basis is the Stress Test and the Hard Drive Test. The Stress Test is a good way to ensure your hardware components such as the processor and graphics card are in good working order. The video card test is great because it shows animated footage of spaceships and galaxies (right down my street!). The hard drive test gives you the option of a quick test or a full test which can take several hours. I always select the Short Hard Drive Test as a Full Hard Drive test would take far too long. Thank you Chris for taking the time to write about your Dell Support Center experiences. The flexibility of the hardware scan means you can set it up to suit your needs. The way you have the schedule setup is much more infrequent than the default option. However, there are no right or wrong answers here. The way you have it setup is fine for your circumstances. The stress test is a good way of ensuring your vital computer hardware is functioning correctly. The test take a short while to complete (and the video card test is quite entertaining I must admit!). The short hard drive test is thorough enough in most circumstances. It is advisable to run the full hard drive test one in a while just to make sure that the unused sectors of your HDD are working OK. If you do encounter any issues in the future I would advise you look towards the help options in the Dell Support Tool. The Community Forum, Online Tools and things like Dell Chat and DellCares Twitter Feed are all good source of information to help you fix any problems. Join in and write your own page! It's easy to do. How? Simply click here to return to Dell Computer Support Center.